Article by John Learned, 02/22/2017. "Things were looking pretty good for SquareSoft in 2000. Just three short years earlier, the developer had finally broken American audiences of their widespread RPG ambivalence with the release of Final Fantasy VII. An unqualified smash, it's practically useless to go over the details yet again of a game that's so widely remembered and endearingly adored all these years later. But for everything that made Final Fantasy VII forward thinking, it would also put a period at the end of a long-standing problem with not only Square, but most other Japanese developers and publishers: its translation. As a company that released very long and equally verbose games, this was a problem needed to be addressed, and quickly. Subsequent translations were exponentially better, of course; but though they were certainly Square's breadwinner, they weren't their only property. And still, even they weren't perfect. The beginning of the new millennium, though, was going to change all of that. 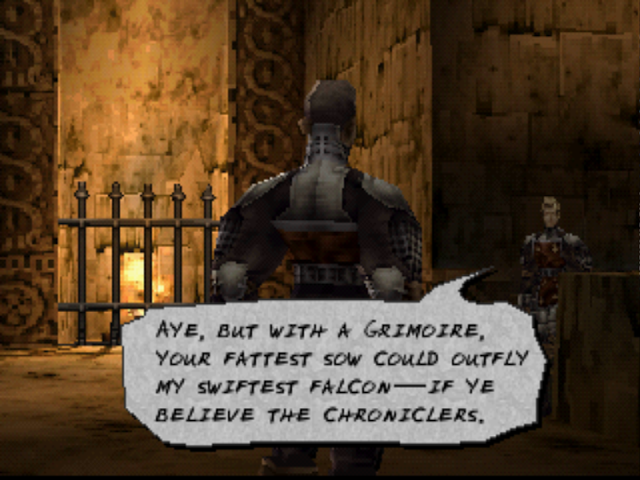 Released that May in North America, Vagrant Story was a significant step forward for English localization. A taut, lean story of dark medieval intrigue and magic, it was a game with a depth of language still uncommonly used to this day. I recently had the opportunity to interview localization editor Richard Amtower and famous translator Alexander O. Smith over email on their breakthrough early work in the field and to reflect on the rise of localization as a craft that truly mattered. "